Click the cover photo at left to download "Fair Winds" No. 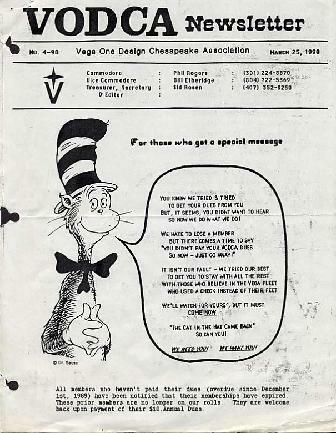 16, the Spring 2007 edition of the Newsletter of the American Vega Association. Many thanks to member Craig Hirt, V1519, "Tern" and to Peter Jacobs, V1331 "Sin Tascha" for scanning these vintage VODCA newsletters by Sidney Rosen and to all those who donated their paper newsletters for scanning. Click the over image at right to go to the VODCA Archive page. We now have 1984 through 2000 available as .pdf files.